After three years of development, this tyre provides a high level of performance in both dry and wet roads. Going with its tagline of “Safe when new, Safe when worn”, MICHELIN PRIMACY 4 tyres respond to the customers’ need of long-lasting performance with exceptional braking results from new until it is worn (up to level of tread wear indicator) even when tested in most demanding wet conditions. Thanks to the use of latest generation elastomers, the new MICHELIN PRIMACY 4 tyre delivers a very high level of grip, from the first to the last kilometer, without compromising longevity. To achieve this level of grip, the tread pattern has been optimized with the new design that reveals squarer and less tapered grooves. Naser Shashaa, Regional Director, and Middle East region, Michelin said: “We are delighted to bring MICHELIN PRIMACY 4 Tyres to our region. The Michelin Group is committed to delivering long lasting performance from the first to the last kilometre and this new range will provide motorists the pleasure of driving without compromising on performance, safety and longevity. The new MICHELIN PRIMACY 4 tyre also simplifies the reading of its wear level. In addition to the presence of a traditional wear indicator on the shoulder, it also has a MICHELIN marking at the bottom of the tread grooves. These two methods allow users to quickly and simply identify the level of wear of their tyres. Compared to its direct competitors, the new MICHELIN PRIMACY 4 lasts an average of 18,000 kilometers (4) more; confirming the long-lasting performance of the new tyres designed by Michelin. The new MICHELIN PRIMACY 4 tyre is a concrete demonstration of the Michelin Group’s strategy: consumers must be able to drive safely, throughout the life of the tyre, right down to the legal wear indicator of 1.6mm. Designed for hatchbacks, entry to premium sedans and cross-overs, MICHELIN PRIMACY 4 is already OE homologated by Audi, Volkswagen, Volvo and Jaguar for some of their vehicle models in specific markets across the world. In GCC countries, some of the replacement market vehicle fitments of MICHELIN PRIMACY 4 include vehicles ranging from Audi A4, Lexus ES350, Toyota Camry, Nissan Altima, Honda Accord, Volkswagen Passat, Kia Sportage, Ford Fusion, Hyundai Tucson, among others. Michelin showcased the new tyre range at two events in Abu Dhabi and Dubai on 10th and 11th July, in partnership with its authorized importers - Central Motors and Equipment LLC, a member of ALFAHIM (importer of MICHELIN tyres in Abu Dhabi and Al Ain) and Central Trading Company LLC (importer of MICHELIN tyres in Dubai and Northern Emirates). During the launch events, Michelin also demonstrated its focus on high-performance tyre business by providing to the dealers a portfolio ranging beyond 350 SKUs available for orders across its product range of-MICHELIN Pilot Sport 4, MICHELIN Primacy SUV, MICHELIN X® LT A/S, MICHELIN Pilot Sport Cup 2, MICHELIN Latitude Sport 3 among others. 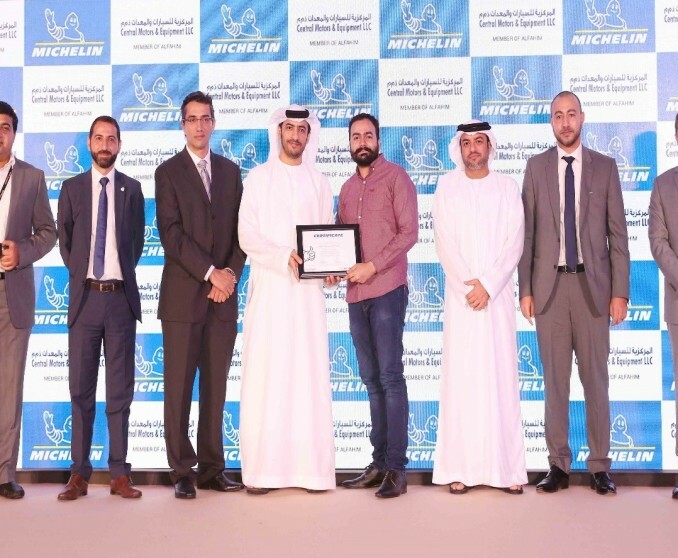 Mr. Mohammed Aqel, the General Manager of Central Trading Company LLC said: “We are proud to be the authorized importer of MICHELIN tyres in Dubai and Northern Emirates and are happy to support the launch of MICHELIN Primacy 4 in this region”.